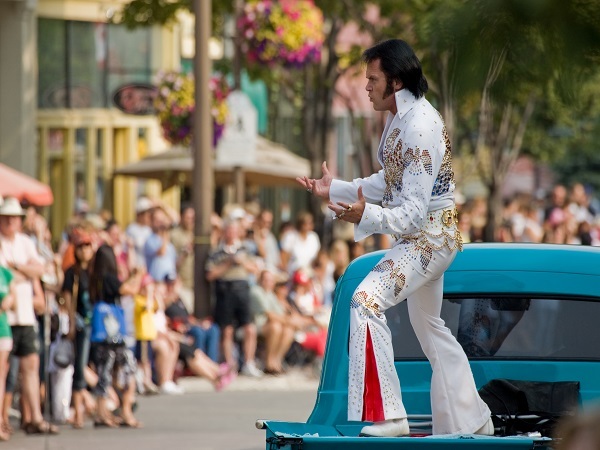 From Thursday, July 23rd to Sunday, July 26th jeweled jumpsuits are taking over the streets of Collingwood for the annual Elvis Festival. Young, old and everyone in between come from all over to experience the world’s largest Elvis celebration. With over 100 Elvis tribute artist acts, street dances, arena concerts, and competitions there’s enough action to bring out the inner Elvis in everyone. The year’s theme ‘This is Elvis’ offers shows and events throughout the weekend that provide a deeper glimpse into the man, his music, his attitude and iconic image. The Elvis Evolution – On Thursday, kick off the weekend with a nostalgic show that delves into the history of Elvis’ success from the early days and beyond featuring the show band and returning Grand Champions. This is a ticketed, family-friendly event at the Eddie Bush Memorial Arena. Annual Elvis Competition – Starting Friday all Elvis tribute artists perform and vie for title of ‘King’™. The competition continues throughout the weekend and wraps up with finals on Sunday evening. A family-friendly event not to be missed for all fans. Lip Curl Contest – Think you have the best Elvis lip curl? Post your best Elvis face and tag #ElvisLipCurl here for a chance to win exclusive VIP passes to the Festival! Sideburns and gold lamé are optional. Memory Lane Street Dance – On Saturday night, dust off your blue suede shoes and bring the whole family out to bop and sway to classic 50s and 60s tunes from the Elvis era belted out by the band A Touch of Vinyl. Elvis at Blue – Take a trip to the mountain to join world champion Elvis tribute artist, Roy LeBlanc, at the Blue Mountain Stage on Sunday from 2 to 4 pm as he performs all your favourites and is sure to have the crowd hopping. For more information, visit The Collingwood Elvis Festival or The Town of Collingwood.